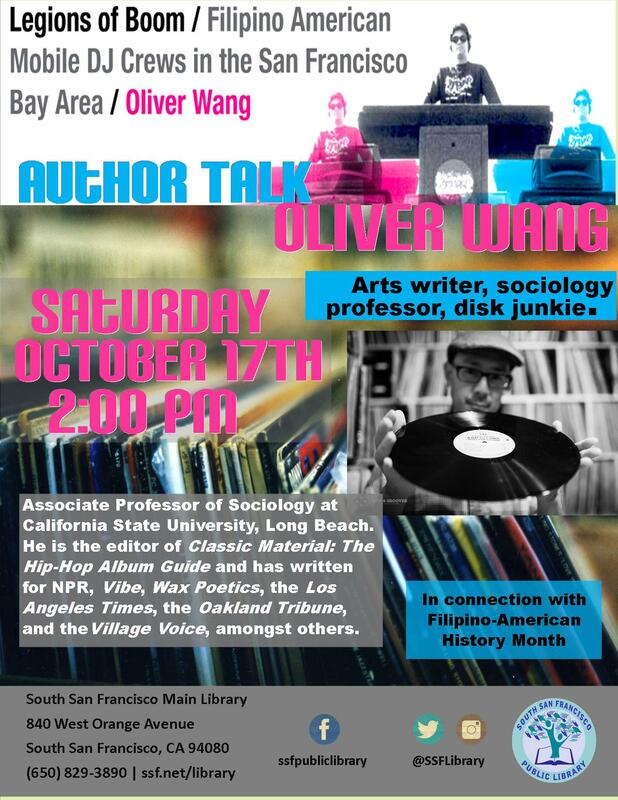 Our celebration of Filipino American History Month continues with a conversation with Dr. Oliver Wang, Associate Professor of Sociology at CSU Long Beach and contributor to NPR, Vibe, the Los Angeles Times, Oakland Tribune, and other publications. He will be talking about his latest book Legions of Boom: Filipino American Mobile DJ Crews in the San Francisco Bay Area. Published by Duke University Press, Legions of Boom details the Filipino American mobile DJ crews, such as Ultimate Creations, Spintronix, and Images, Inc., which rocked dance floors throughout the San Francisco Bay Area from the late 1970s through the mid-1990s. Wang, noted music and pop culture writer and scholar, chronicles this remarkable scene that eventually became the cradle for turntablism. This free event will take place Saturday, October 17th, at 2:00 p.m. at South San Francisco Main Library.